It is hard to tell where the yolk is in an egg until you open the shell, but often the yolks are off-center. Although you might not care much if the yolks are centered in hard-boiled eggs you are planning to chop up for egg salad, the position of the yolk matters more in other dishes. For example, off-center yolks make deviled eggs look less appealing and increase the chances of breaking the thin egg white on the side where the yolk ended up. Take a couple approaches to centering your yolks. Turn the raw eggs onto their sides in the egg carton. Place the egg carton on a shelf in the fridge. Because the eggs are on their sides, you will not be able to close the egg carton. If you prefer, cut the top off the egg carton to save space. Wait about eight hours, or overnight, to allow the yolks to move out of the positions into which they had settled. Place eggs in a single layer on the bottom of a pot. Fill the pot with water, until it completely covers the eggs by at least 1-inch. Cover the pot and heat it over high heat until it comes to a boil. Gently boil the eggs for approximately two minutes. Remove the pot from the burner and let it sit, covered, for 12 minutes. During this time, fill a bowl with ice water. Gently remove the eggs from the pot with the tongs or slotted spoon and place them in the bowl of ice water. Cool the eggs for 15 minutes before removing them from the ice bath. Peel and eat immediately or store them in the fridge for up to one week. If you would prefer, tape the egg carton shut and store the whole carton on its side instead of turning the eggs individually. Hold the carton tightly shut while you remove it from the fridge in case the tape has loosened. 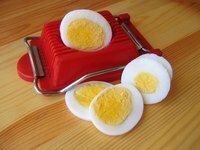 Boil eggs that are at least one week old because older eggs are typically easier to peel than newer eggs.